Dr. Matthew Murchison wants to make his corner of the musical world a better place. If his concerts were a Dickens novel the first sentence might be: “It was the highest of brows, it was the lowest of brows.” Matthew believes everyone deserves high-quality, interesting, and funny entertainment, from contemporary electronic music to songs about cat anuses. Matthew was a member of River City Brass in Pittsburgh, PA from 2002-2015, where he was a featured soloist hundreds of times. His solo performances with the River City Brass have been broadcast across the country and his comedy songs have been enjoyed by tens of people from every dark corner of the internet. 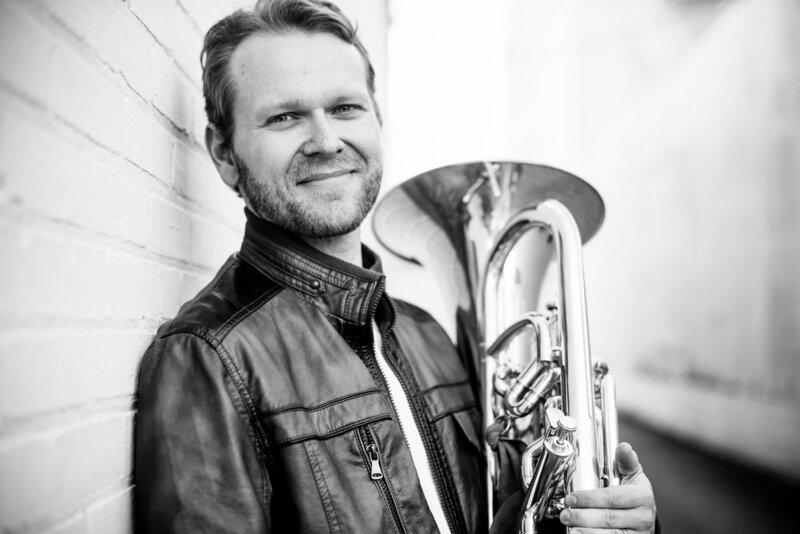 As a musician, Matthew primarily plays euphonium, tuba, and ukulele, performing exclusively on the XO euphonium. Under a full moon you may hear him play trumpet, bodhran, or didgeridoo. He has served as producer for CD recordings and can be heard on solo, chamber, large ensemble, and rock band albums. Matthew has performed solo and chamber music concerts all across the United States as well as in South America, Europe, and Asia. He has been able to perform with such groups as the Brass Band of Battle Creek, the United States Army Band “Pershing’s Own,” Mr. Jack Daniel’s Original Silver Cornet Band, Denver Brass, the Pittsburgh Symphony, and the Dallas Wind Symphony. Matthew self-publishes a number of his compositions though his website, while others may be obtained only after completing a series of magical quests. Recent performances of his award-winning compositions have taken place across the US, as well as in Japan, South America, and Europe. He released his first solo album entitled “Everyone But Me” in 2003. As a member of the River Bottom Quartet, Matthew’s arrangements and playing can be heard on the album “In Too Deep.” Matthew’s newest album, “Reminiscence,” is a collection of American songs and folk tunes and is available on his website now! As a conductor, Matthew has worked with the West Virginia Symphony Orchestra Brass and Percussion Ensemble and has served as a guest conductor/clinician for honor bands. He has been a soloist multiple times with the West Virginia Symphony Orchestra as the euphonium-playing Santa Claus, making Art performing his variations on “Grandma Got Run Over by a Reindeer.” The Santa beard is very itchy. He has also been hired to write jokes and perform as the emcee for concerts, and has been a judge for international performance and composition competitions.